Although compounds that led to OT-82 were found via phenotypical cell based screening of chemical libraries, its mechanism of action was elucidated and confirmed through a combination of shRNA screening and affinity chromatography approach. OT-82 is an NAMPT (NicotinAMide Phosphoribosyl Transferase) inhibitor. NAMPT catalyzes conversion of nicotinamide to nicotinamide mononucleotide (NMN), a precursor of NAD. That determines its key role in bioenergetics of the cell and in the activity of NAD-dependent proteins, such as sirtuins, PARPS, etc. NAMPT exists in intracellular and extracellular forms. In the cell NAMPT is present in the cytoplasm and nucleus. Its phosphorylated form has 100-times higher activity. The role of other post-translational modifications is not defined yet. 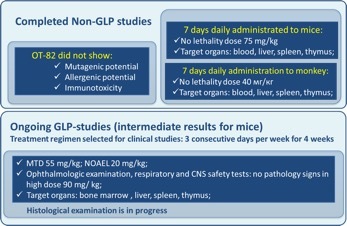 In 4 week GLP study in mice, NO DETECTABLE RETINAL TOXICITY was found. 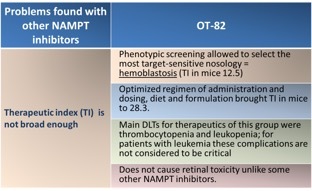 In addition, although NAMPT inhibition potency of OT-82 is similar to other known inhibitors in vitro, it demonstrated higher potency in an in vivo pre-B cells acute lymphoblastic leukemia (ALL) xenografts. This test was run at the Children’s Cancer Institute Australia for Medical Research (CCIA) according to the NCI-supported Preclinical Testing Program protocol established for evaluation of new agents against solid tumors and leukemia models.